Two separate construction projects will affect traffic flow around Munson Medical Center beginning Monday, April 15. On the campus’ north side, Beaumont Place will be closed at Sixth Street through May 13. This will allow for work to shift Sixth Street to the north, near the Cowell Family Cancer Center canopy. Meanwhile, a project to complete Kids Creek restoration on the campus will also shift the Emergency Department entrance to off of Medical Campus Drive. 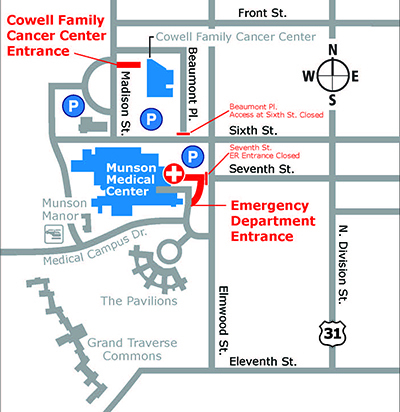 From April 15 through May 13, access to the Cowell Family Cancer Center will be available off of Madison Avenue via Front Street or Sixth Street. Starting May 15 through June 14, the Madison Avenue entrance to the cancer center will be closed as the Sixth Street move is completed. Access to the cancer center will be via the east side off of the newly shifted Sixth Street. On June 14, what is now Sixth Street between the hospital’s main entrance and Madison Avenue will be permanently closed and circulation traffic routed via Beaumont to the new Sixth Street. Construction on the Surgical Services project will begin. Limited parking will continue in front of the cancer center until the next phase of the project starts in a few years. Meanwhile, the final phase of the Kids Creek project gets underway Monday requiring closure of the Emergency Department entrance at Elmwood Avenue and Seventh Street. Entrance to the Emergency Department will temporarily shift to Medical Campus Drive. Signs will be posted. The project is expected to take six weeks to complete. Learn more about the construction project.